Published: Nov. 25, 2018 at 02:25 p.m.
Carolina Panthers wide receiver Curtis Samuel gets the pitch from quarterback Cam Newton and races down the sideline for a 25-yard gain. Published: Nov. 25, 2018 at 02:19 p.m.
Carolina Panthers wide receiver Curtis Samuel burns Seattle Seahawks cornerback Shaquill Griffin off the line to get open in the end zone for a 7-yard touchdown. 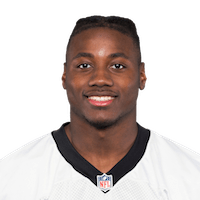 Published: Nov. 18, 2018 at 03:36 p.m.
Carolina Panthers wide receiver Curtis Samuel leaps into the air and catches the ball while falling backwards for a touchdown.